There are several chemical applications out there. This is a list of the ones we find especially useful. :'''XDrawChem''' is a Qt-based application to draw molecular structures. :With '''Jmol''' you can view molecules inside your browser. All you need is java enabled in your browser. 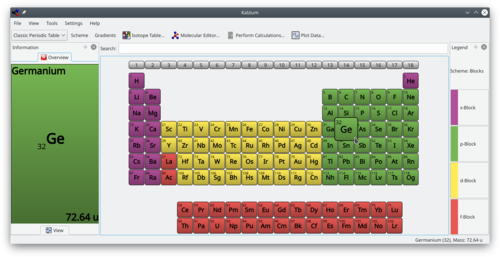 :The ''Gnome Chemistry Utils'' provide C++ classes and Gtk+-2 widgets related to chemistry. :This Windows&trade; software package - free for students, runs via wine on Linux - is in my opinion the best drawingapplication. It is really almost perfect and even supporting a 3D-viewer. :'''ChemTool''' is a GTK application for drawing chemical structures. :''Open Babel'' is a project designed to interconvert between many file formats used in molecular modeling and computational chemistry.